He remembered the last time he saw her. That day, the Harmattan sun had blazed more than it did on other days; and the air, dry and harsh to his nose, made him carry a handkerchief around. More than anything, what he remembered from that day, the Fourth of October, was a face, one that had kept him awake every night. The preparation for his mother’s burial was met with a flurry of activities. Meeting new people at every turn had been the hub of his activities. At the funeral, he had observed her from the corner of his eyes and, at times when their eyes met, he noticed that there was a particular way she looked at him. “Who is the fair-complexioned lady?” He asked his sister. “She looks familiar,” he said, wheeling himself to meet more faces. It was just a month since he had been discharged from the hospital and there was a different aura to everything around him. Everybody acted extremely kind. Each moment was spent reliving the accident. The words from his mother had made no sense to him that night. She kept muttering gibberish to herself in half-concentration and, before he could say Jack Robinson and point out the car in front of them, glasses shattered, bones broke, blood flowed and a heart stopped beating. “Can we go out to the garden? The noise is getting at me,” he said as she wheeled him out. She sat on a chair under the trees and faced him, and then she crossed her legs so that the freshness of her thighs lay exposed. “You are tall for a lady,” he looked at her. “Maybe a little shorter than you are,” she said and smiled. He liked the fact that she did not act all pitiful towards him as if he was a helpless child. “I used to run in secondary school. I could race you,” she said, giving that smile she had earlier given him, and looked at him as if her eyes had honey in them. “One of these days we will race,” he said, smiling back. Then a funny silence came between them as if they were lost in each other’s thoughts. He stared at his legs. “Thanks Kachi,” he looked into her eyes and held her hands, as if searching for the gold that reflected the purity in her. “My discharge letter arrived from the army headquarters today honey,” he pulled the letter from the left pocket of his combat shorts. “You will do great with the new business you have started,” she read, and snuggled into him in the settee. Her skin turned rubicund, and the dimples in her cheeks sunk into two pits of beauty, her dark deep eyes seemed to smile. She sat on his lap and planted a kiss on his cheeks and drew a long kiss to his mouth. “You’ll always be my man. It was not a man confined to a wheelchair that I saw. It was a man my heart pounded for. A man I wanted to love.” She caressed him and rubbed her hand on his head, and then played with the hairs on his chest that peeped through his singlet, snuggling deeper into him and kissing his dark, smooth cheeks. “Good morning mama,” Kachi greeted her mother as she cleared the utensils used the previous night. “Good morning dear,” her mother said, with her hands crossed under her breasts that were held by the wrapper she wore. “Mama, Damien proposed to me yesterday. You should have seen how handsome he looked,” she smiled as she recollected the moment. That day, the Fourth of October, two years exactly since they started dating, Kachi came to visit him. Her eyes were red and her face was a long wet raincoat. “I have been trying your number for a week. What’s wrong? Why are you crying?” She hugged him and wept on his shoulder, allowing herself to lean freely into him. Her sobbing increased. He embraced her tighter and kept quiet. They both heaved a sigh and kept more silence to breed between them. 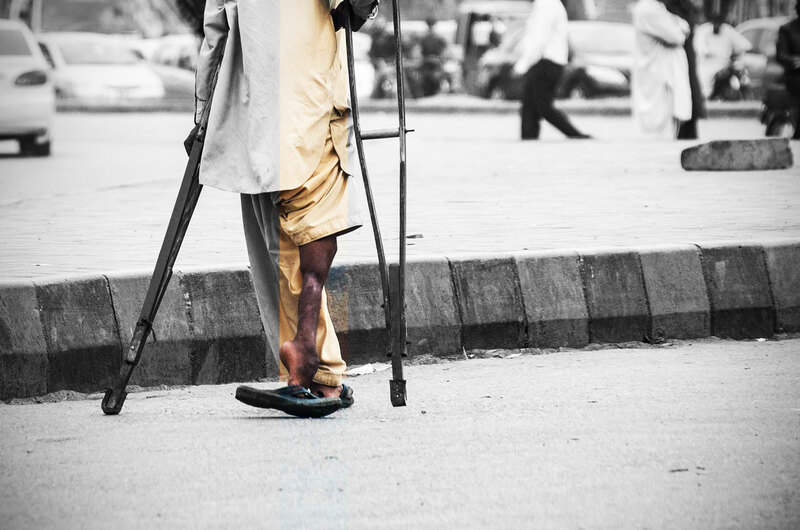 “Cripples?” He felt his body grow limp and cold, as if the crutches could not support him. She nodded her head and avoided his eyes. She did not want to see the pain hidden in them. For two years he had built his life around her. He wobbled out of the living room to the clicks of his crutches. He would never forget her face. Socrates Mbamalu (@linsoc) is a writer who has participated in two Writivism workshop editions (2014 and 2015). He is a blogger for Afridiaspora and Waza Africa and some of his works have appeared in Kalahari Reviews, Muwado.com, Deyu African and Muthal Naidoo’s website. He is keen on Africa as a continent with regards to Politics and Arts. He was mentored by Yewande Omotoso in 2014.